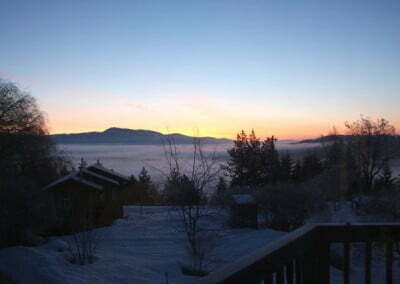 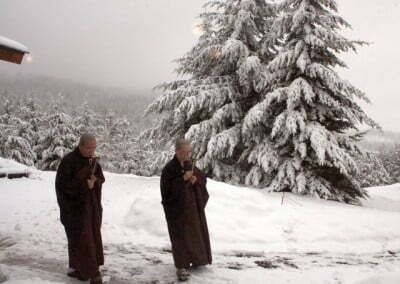 With retreatants coming from Mexico, Canada, Montana and a record two participants from Louisiana, the Green Tara retreat, the 6th winter retreat offered by the Abbey begins. 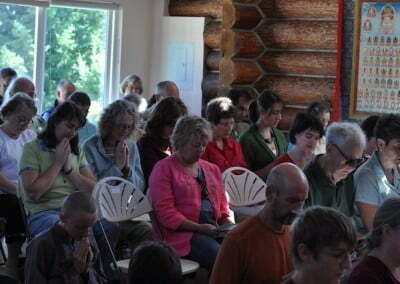 Along with the 16 residential retreatants, there are over 225 (and counting) that will be doing the retreat from afar. 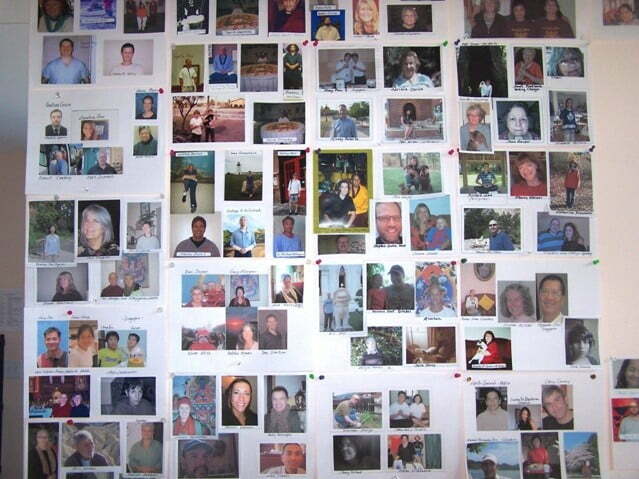 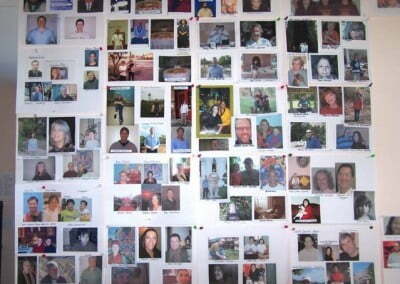 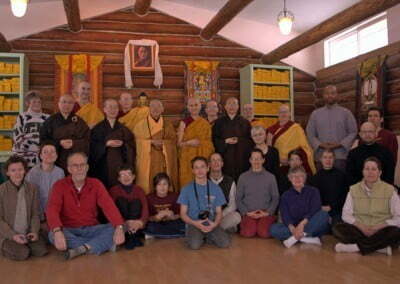 Having their pictures in the meditation hall with us is very inspiring. 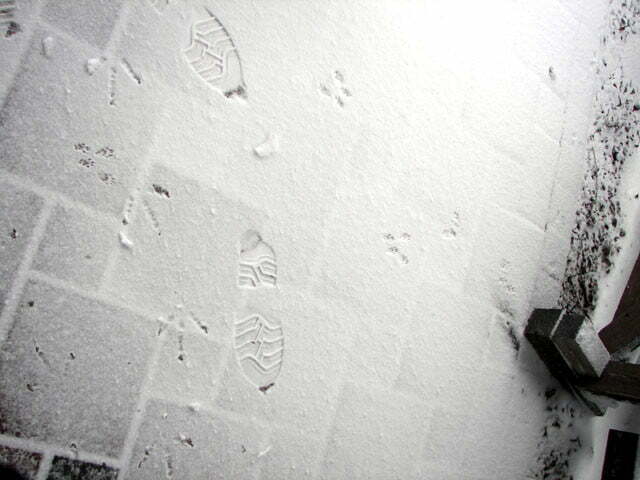 We’ll keep in touch as the next few months go on. 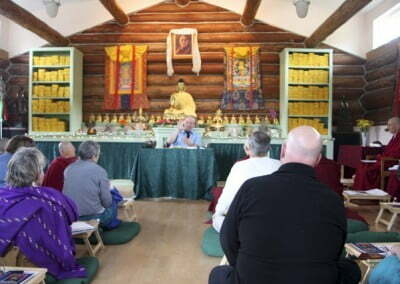 Jeffrey Hopkins, one of the most respected Western scholars and translators of Tibetan Buddhism, made his second visit to Sravasti Abbey in September and gave a teaching on one of his favorite topics: compassion. 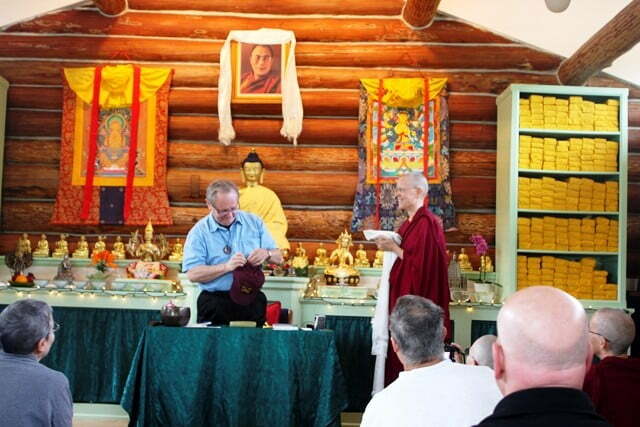 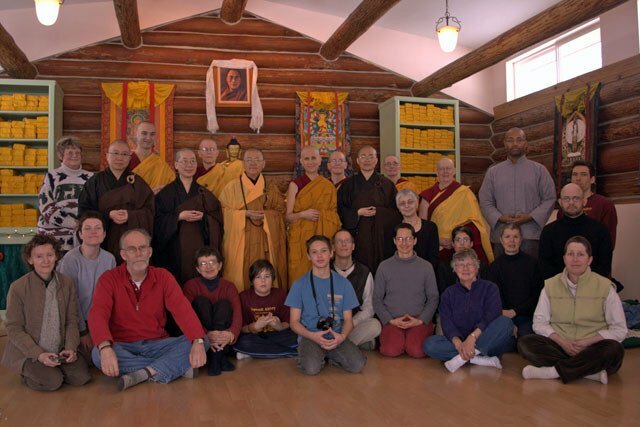 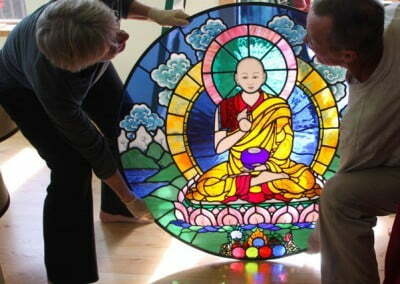 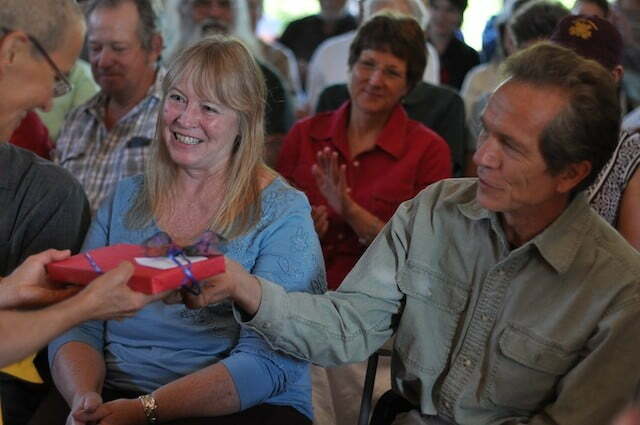 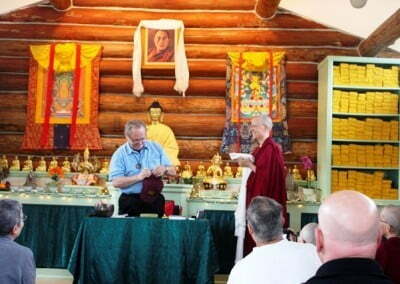 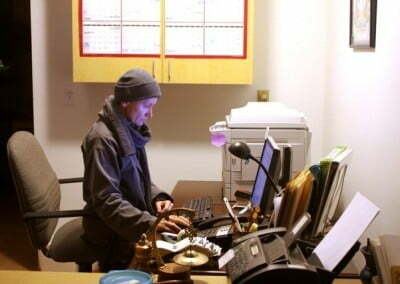 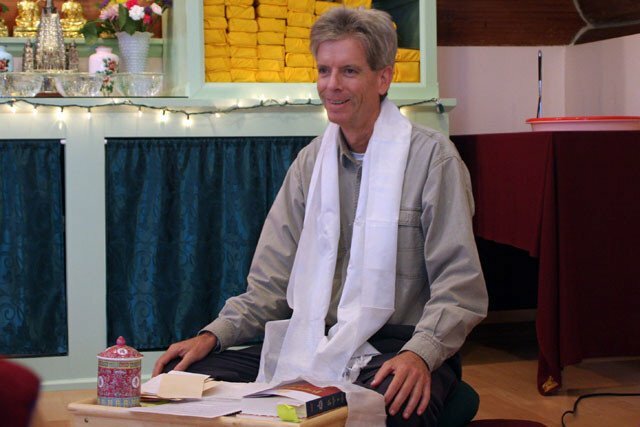 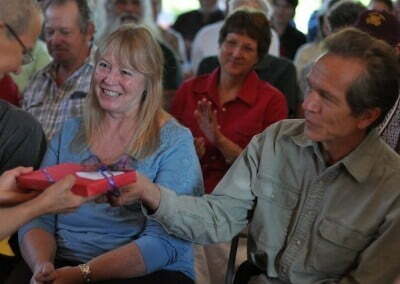 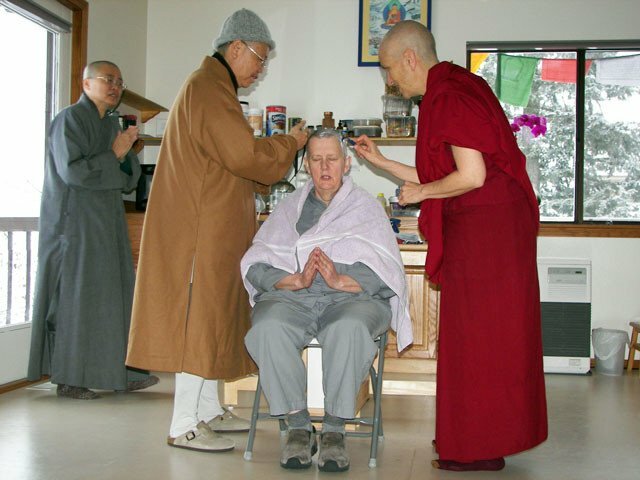 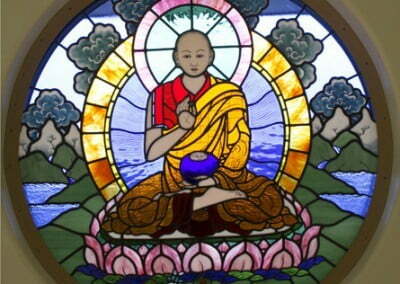 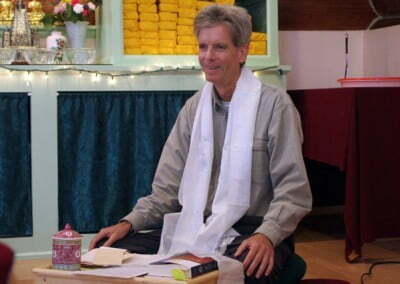 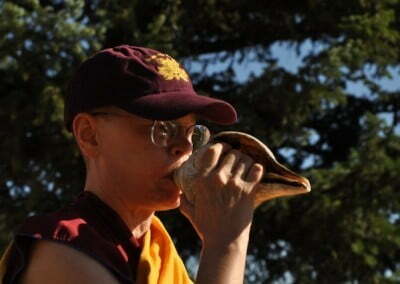 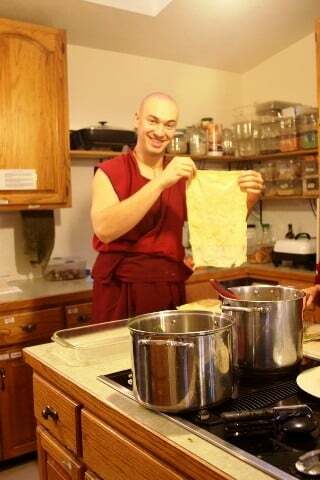 Jeffrey’s humor, mixed with his vast knowledge of the Dharma, makes the Buddha’s teachings very accessible. 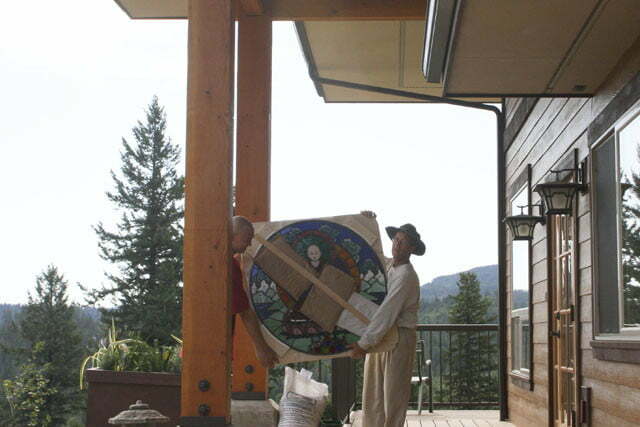 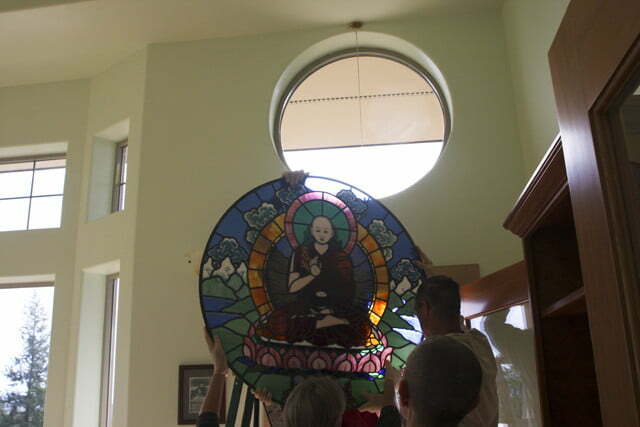 Prayers and the support of friends from around the world, along with skilled professionals and the hard work of the Abbey community, bring Gotami House to completion. 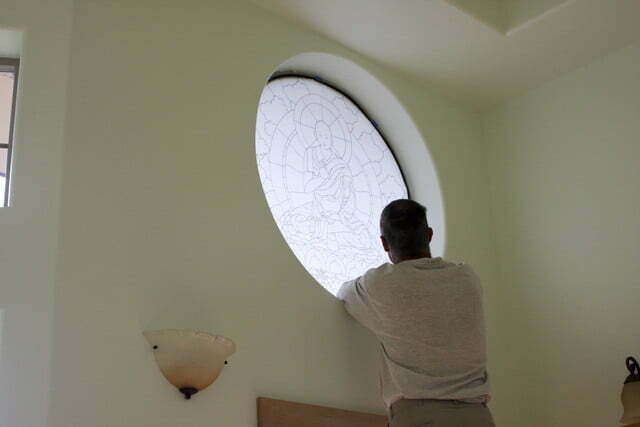 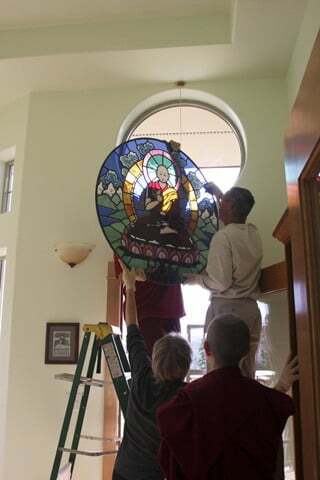 On September 26 we consecrate the building and dedicate the merit. 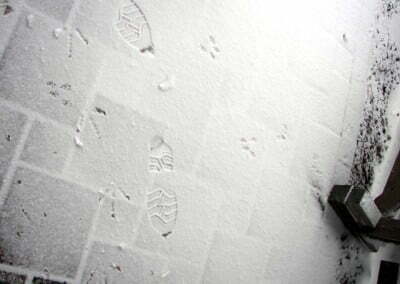 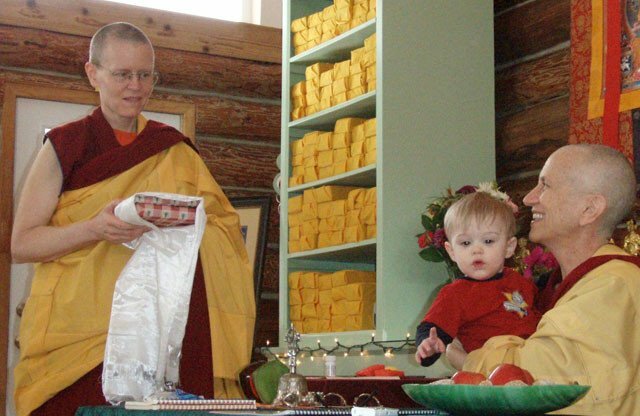 See how the auspicious day unfolds. 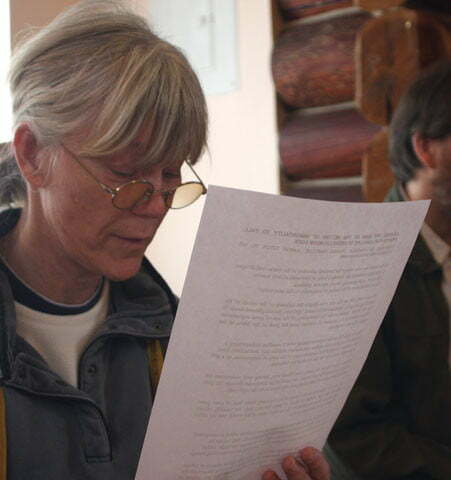 She rode across South Dakota, into Wyoming, through Montana and Idaho in a car. 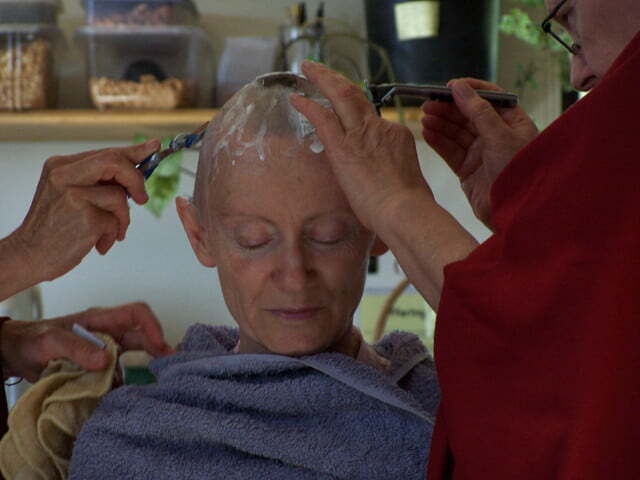 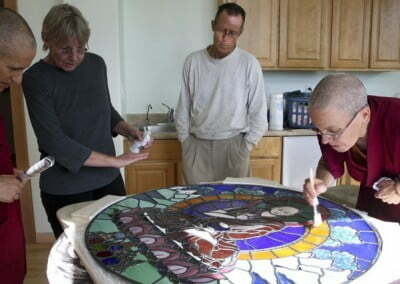 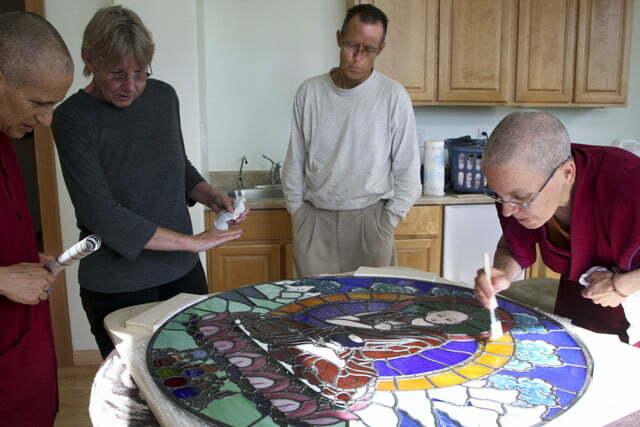 Then carefully and gently under the watchful eye of Beverly Brecht, the artist, at Gotami House. 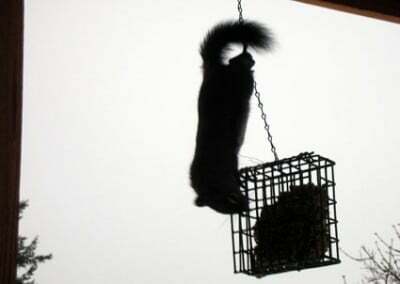 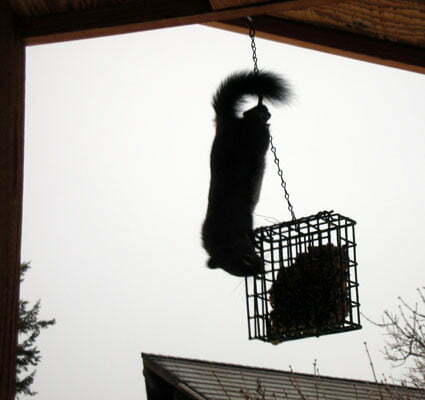 Here is how it unfolded. 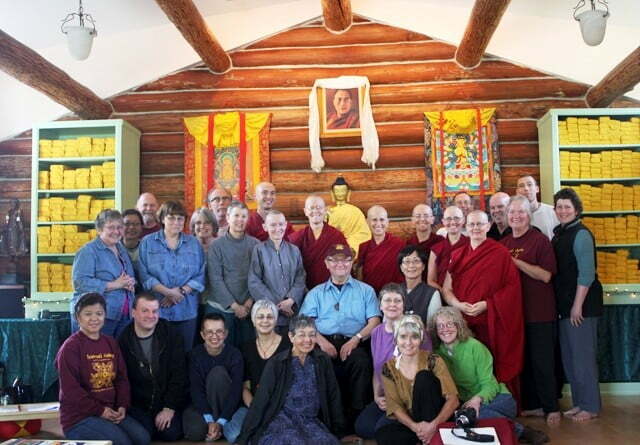 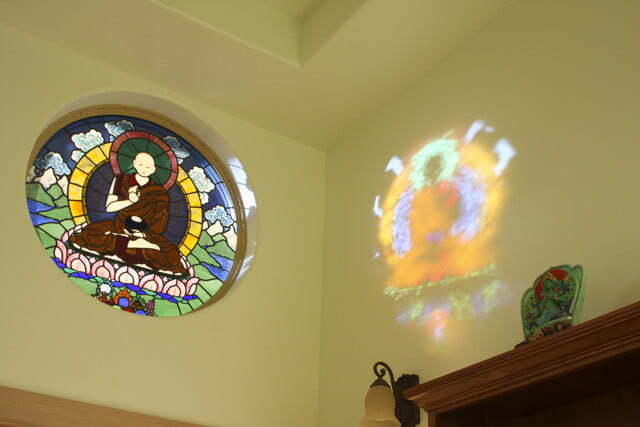 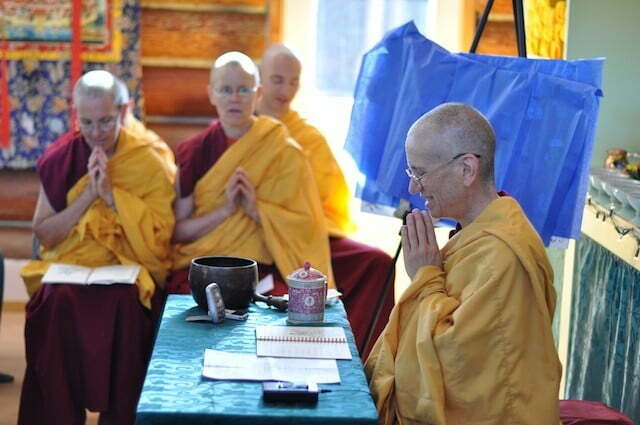 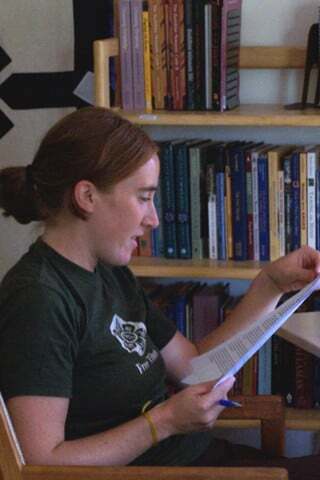 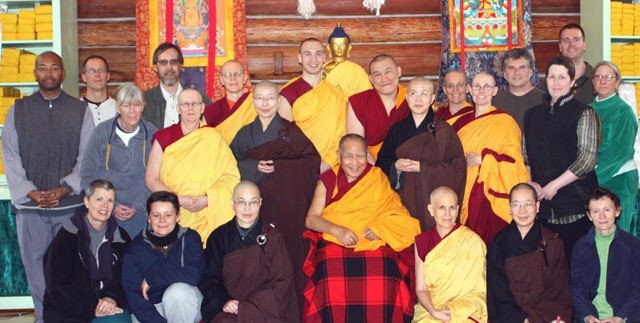 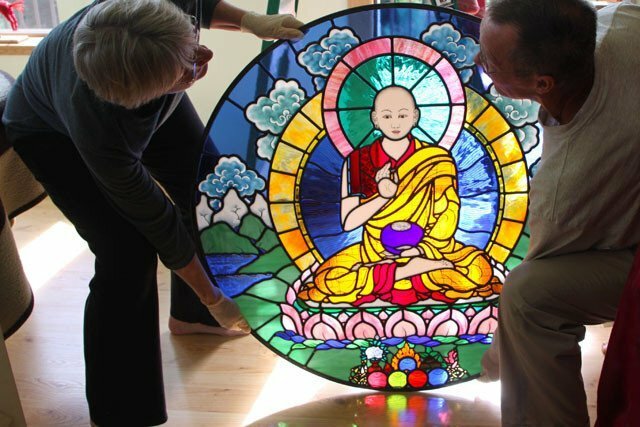 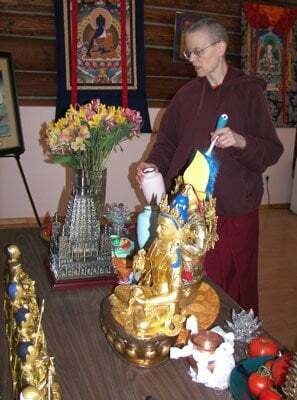 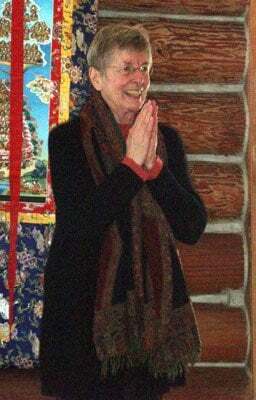 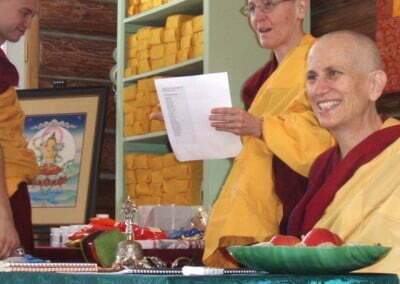 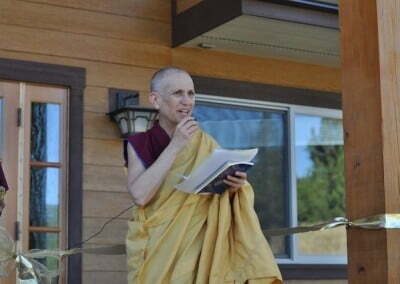 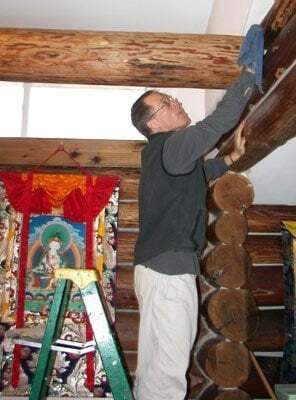 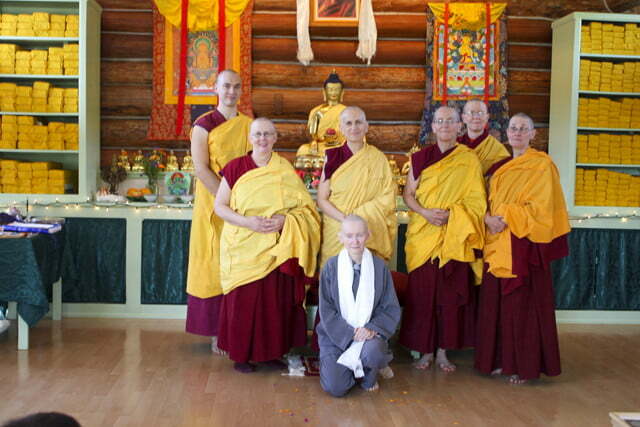 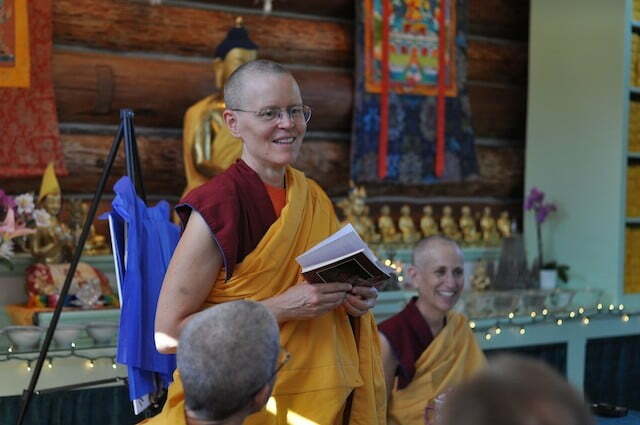 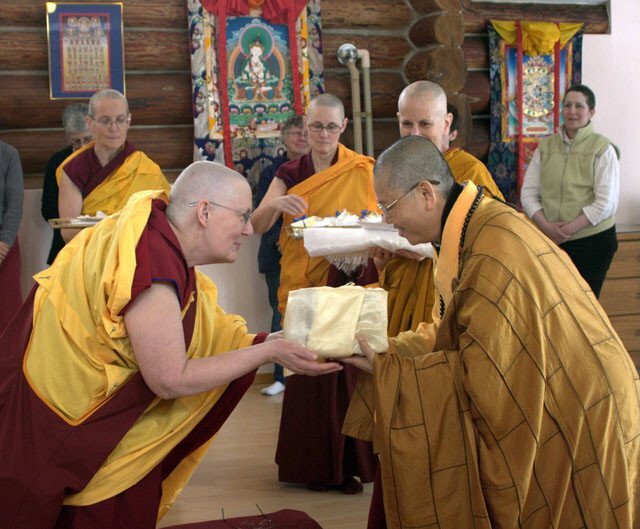 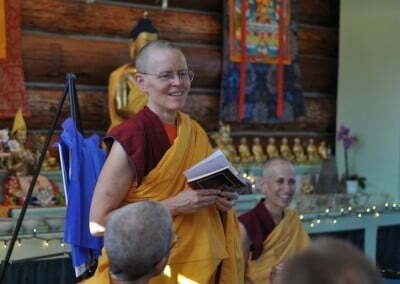 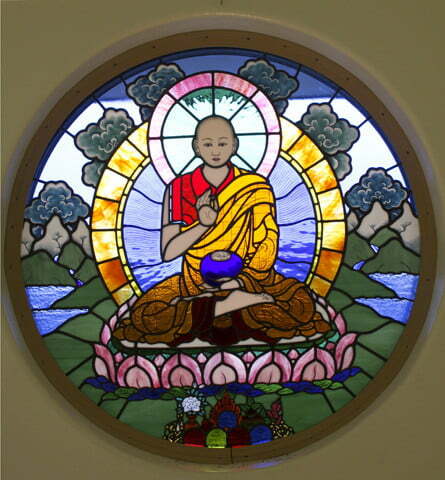 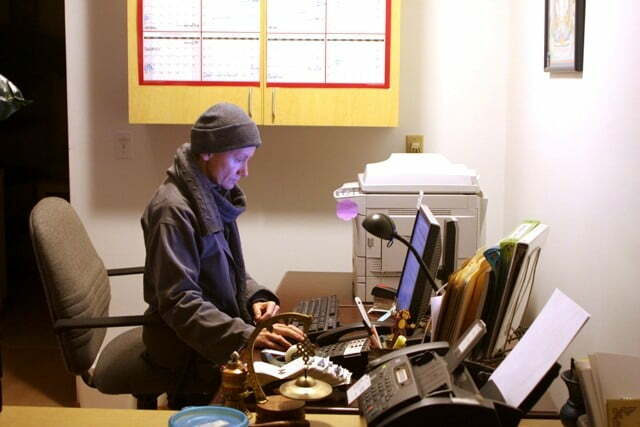 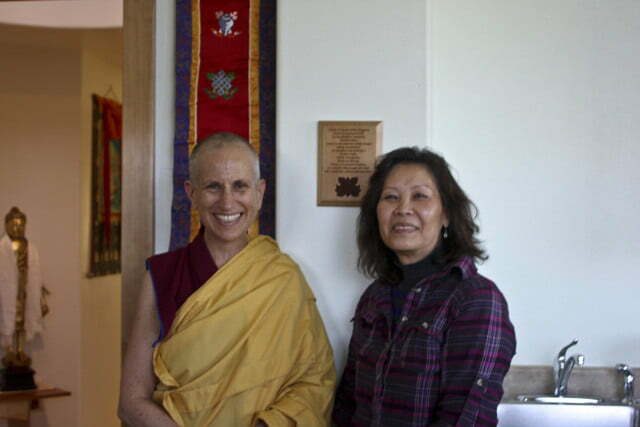 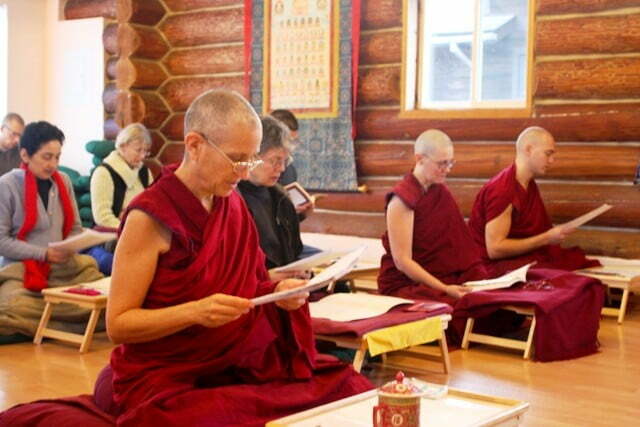 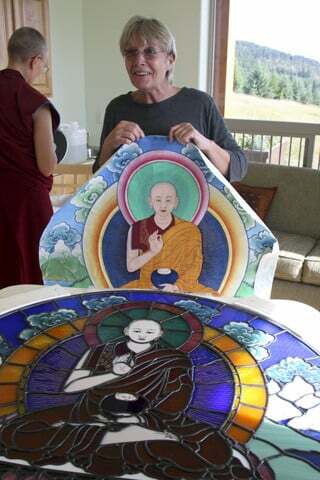 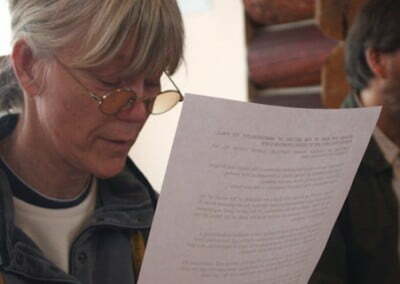 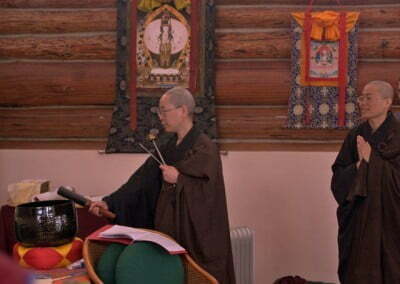 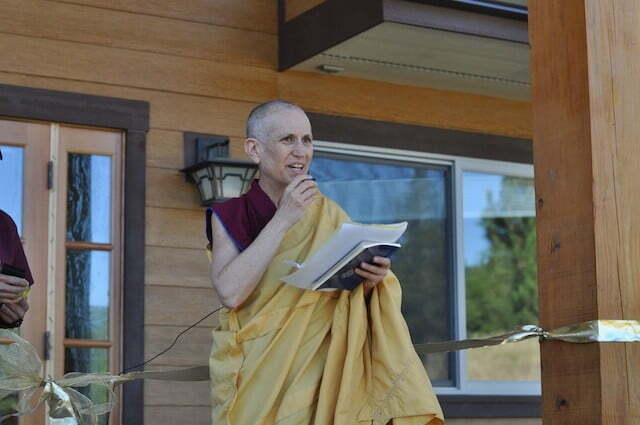 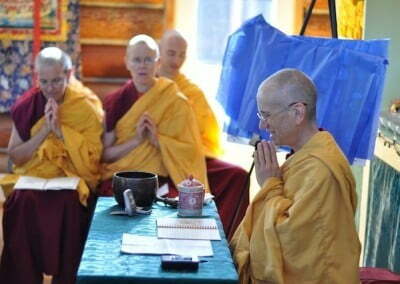 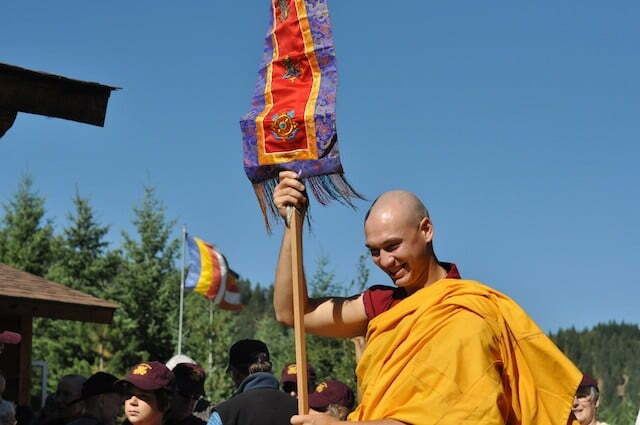 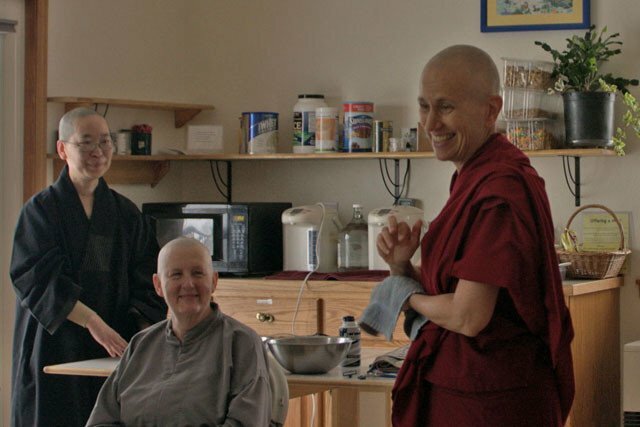 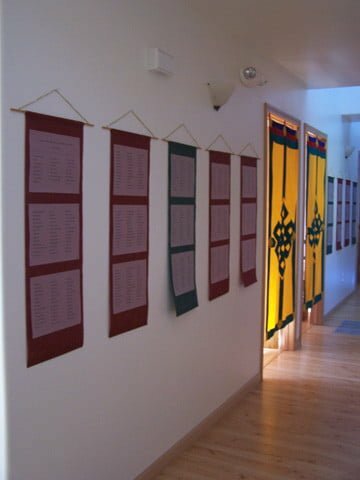 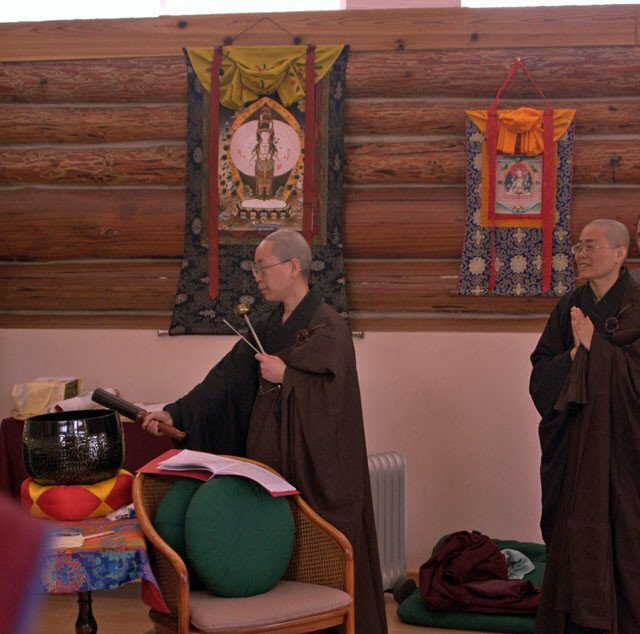 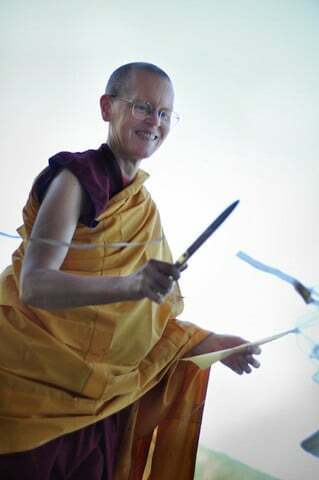 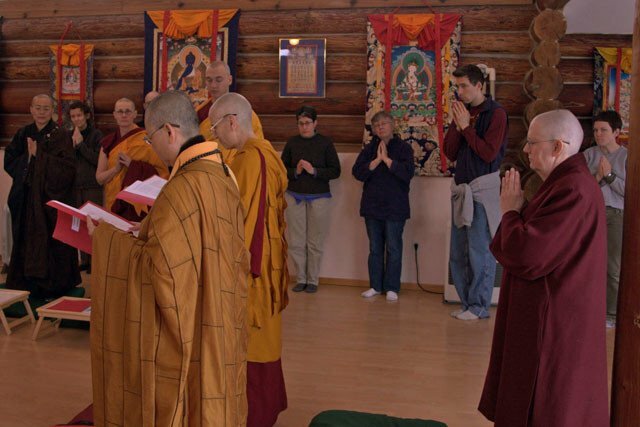 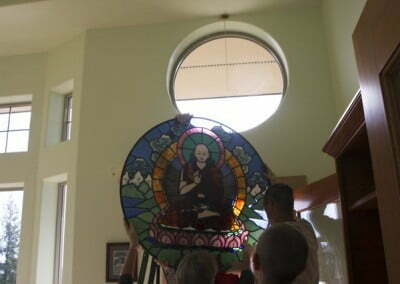 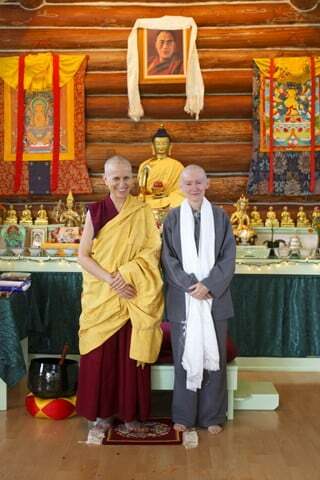 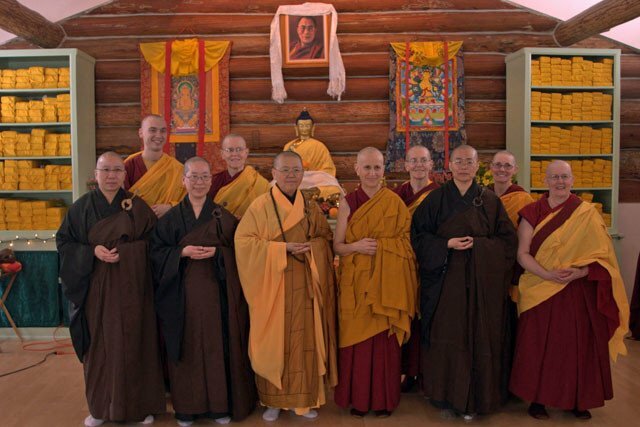 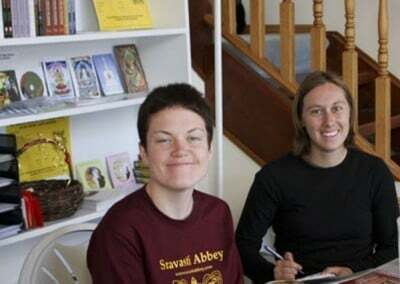 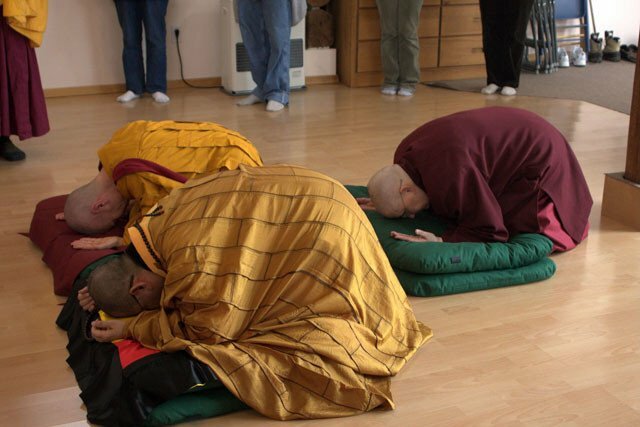 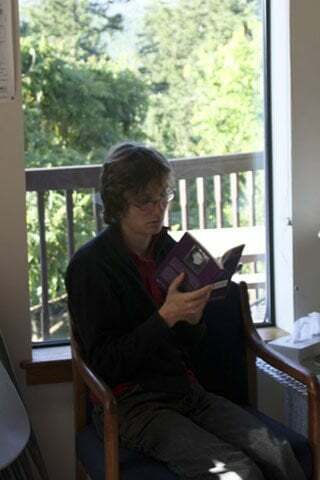 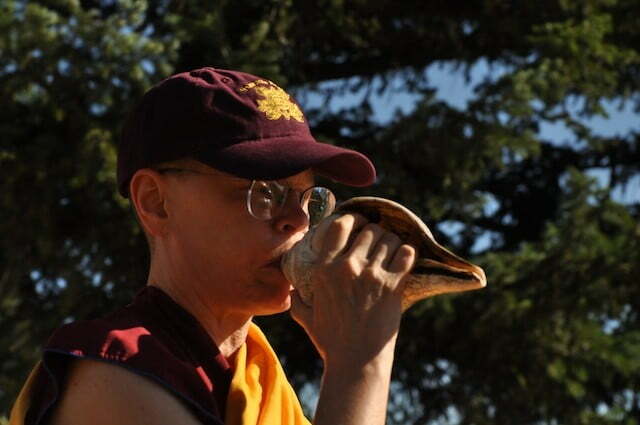 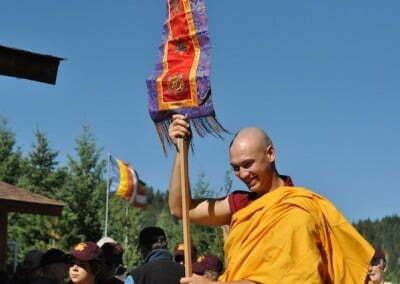 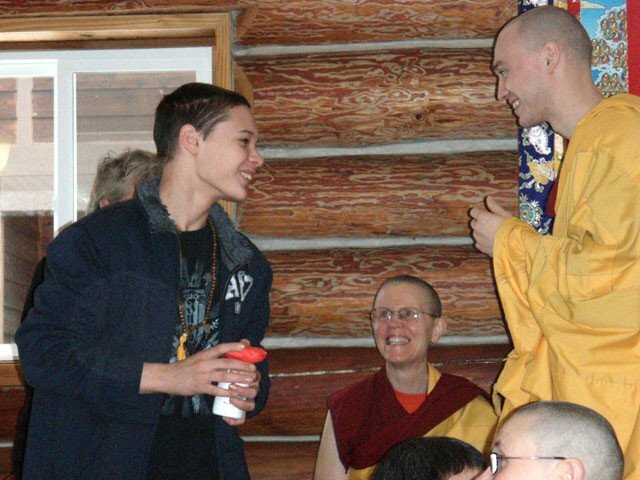 Dallas, one of Venerable Chodron’s long time students and an Abbey resident, takes the first step towards ordination by taking the 8 anagarika precepts on June 30. 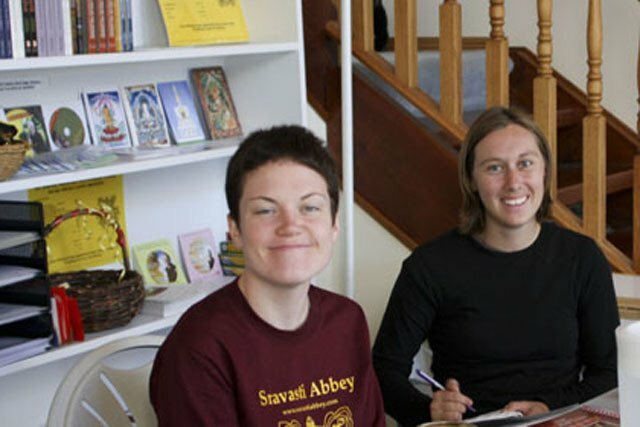 The Abbey community is growing! 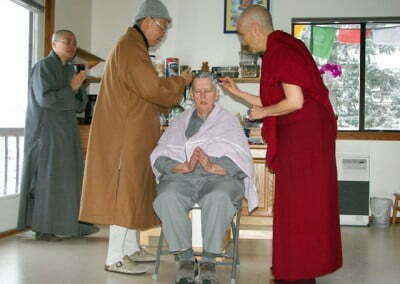 May it continue to do so for many lifetimes to come. 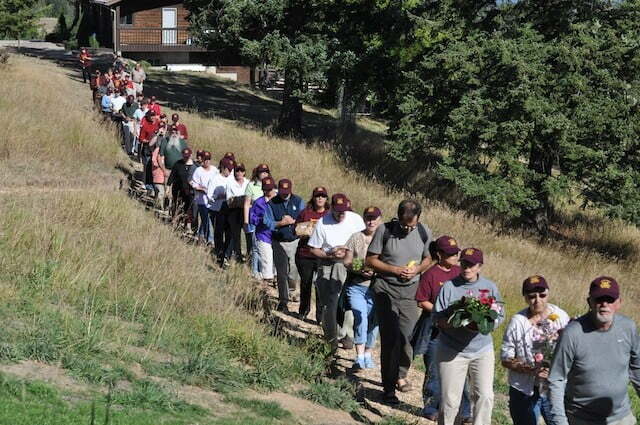 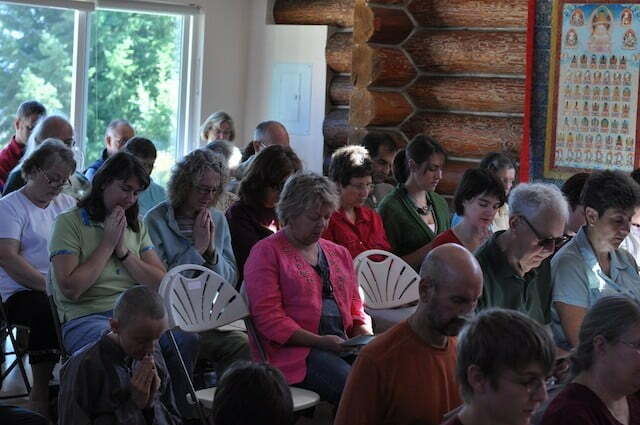 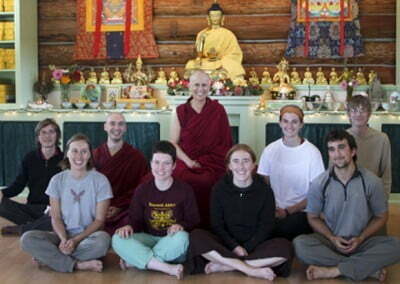 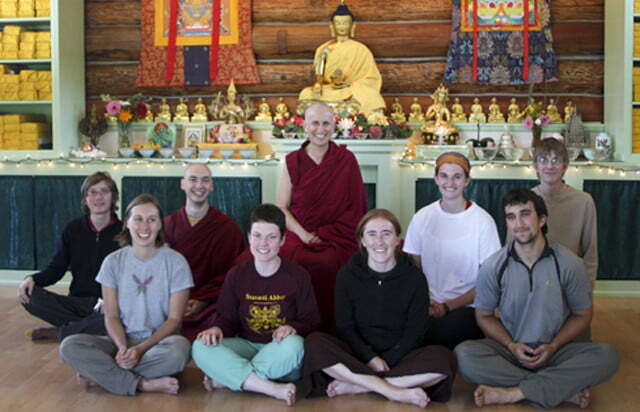 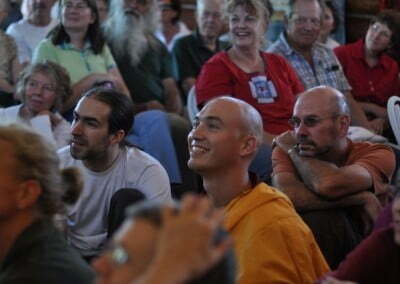 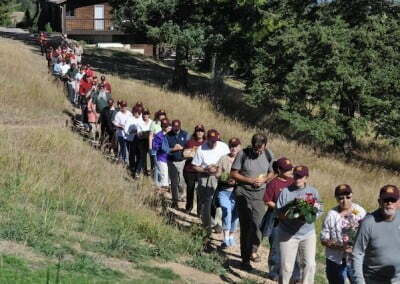 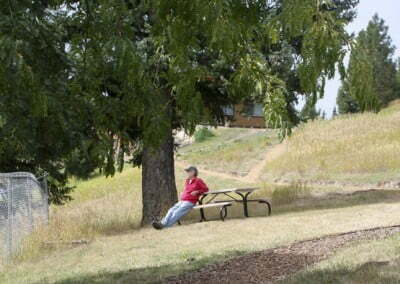 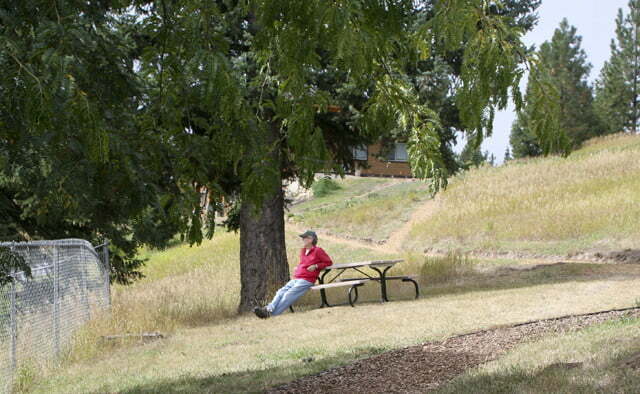 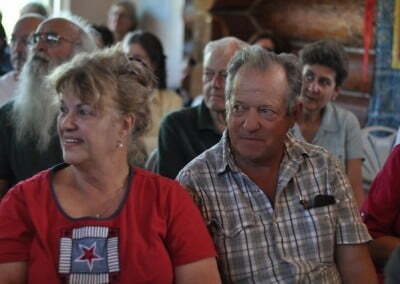 Sravasti Abbey offered its 4th Exploring Buddhism Week in July. 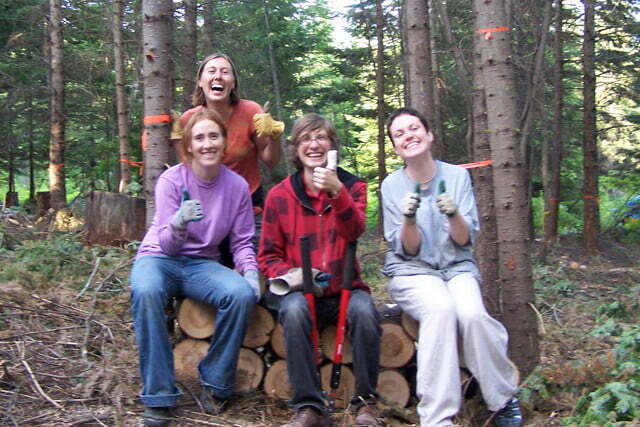 It is a great experience for the community and the participants. 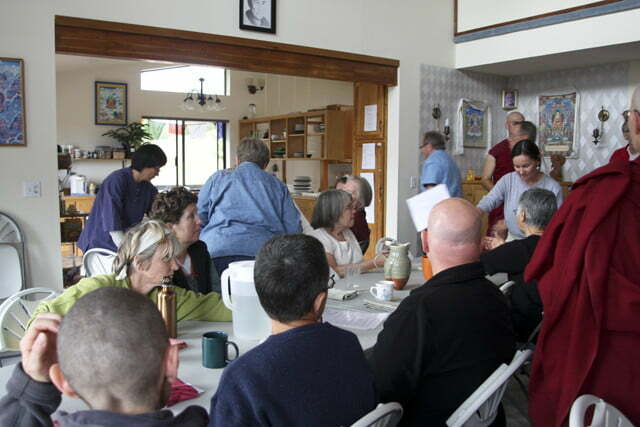 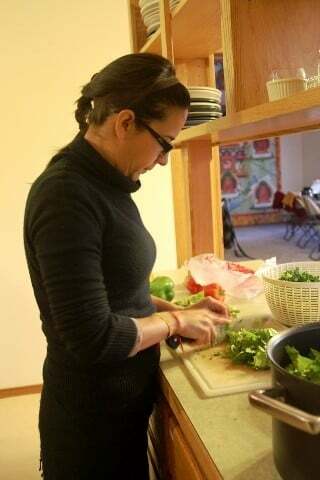 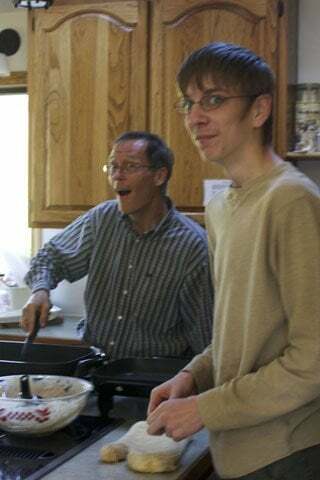 The Abbey community supports the young adults with making meals, offering service opportunities, and one-on-one heartfelt Dharma conversations. 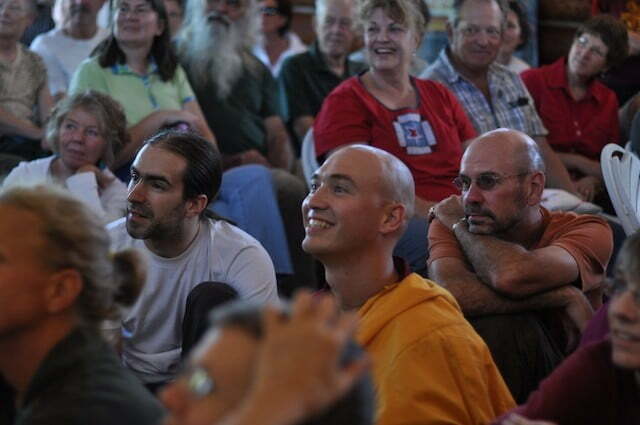 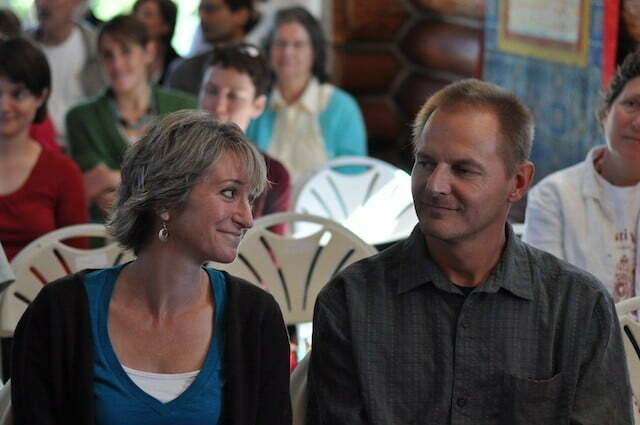 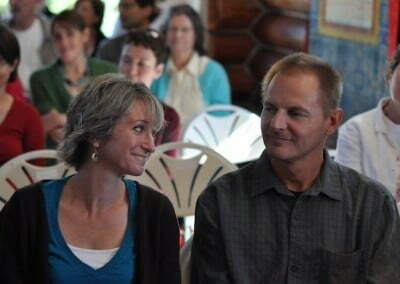 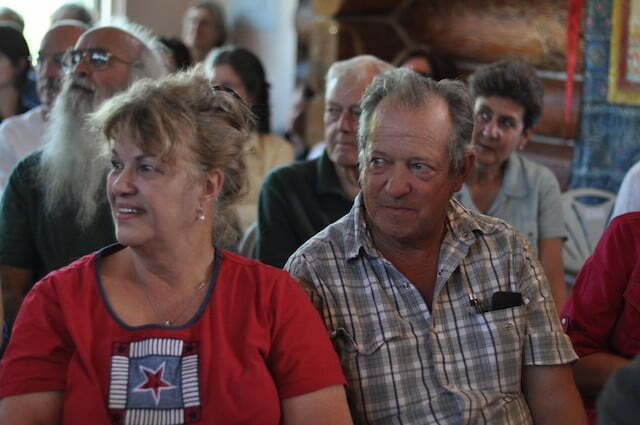 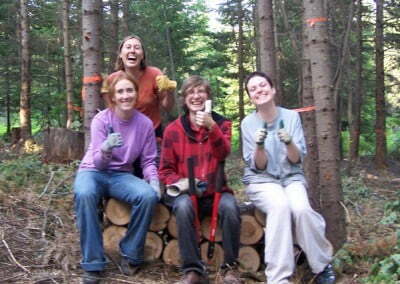 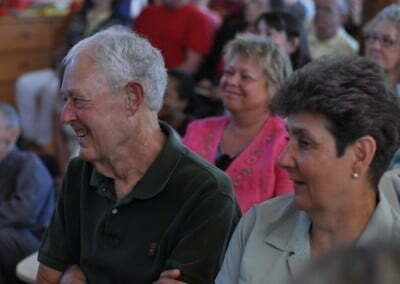 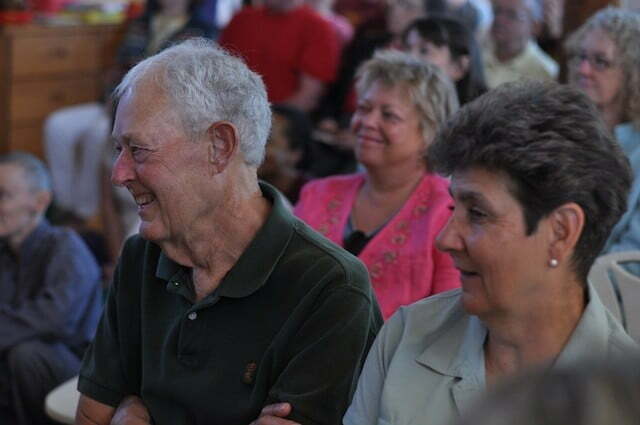 The young adults bring great joy, enthusiasm, and questioning minds to the week-long event. 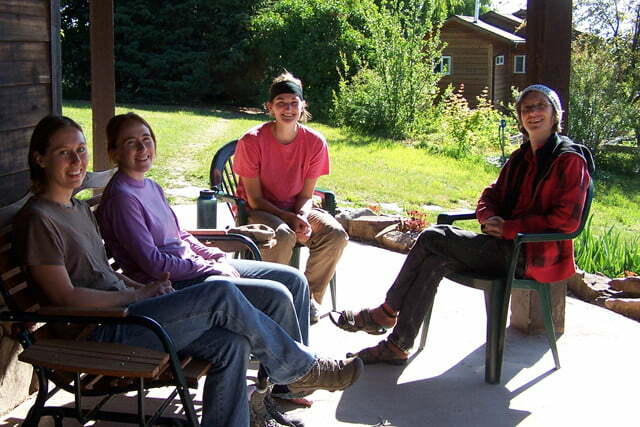 We all had fun! 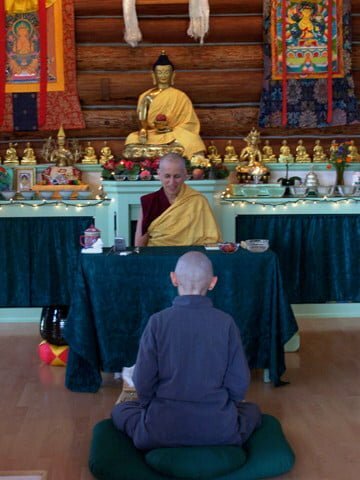 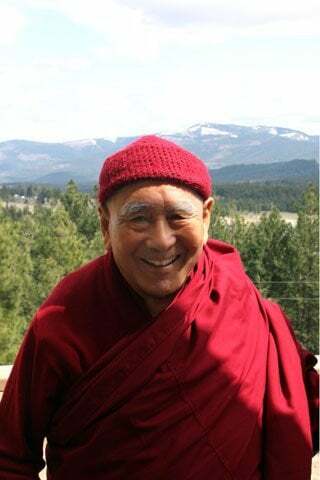 We were very happy when Geshe Sopa, author of Peacock in the Poison Grove, accepted our invitation to teach on Santideva’s Bodhisattva’s Way of Life, Chapter 6: Patience. 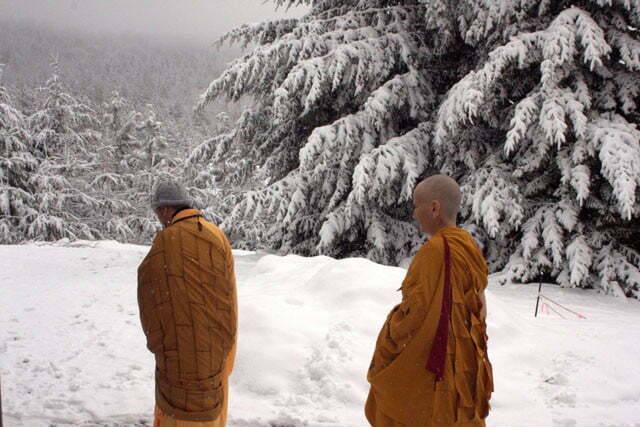 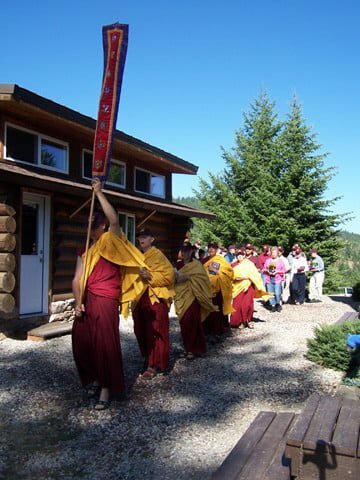 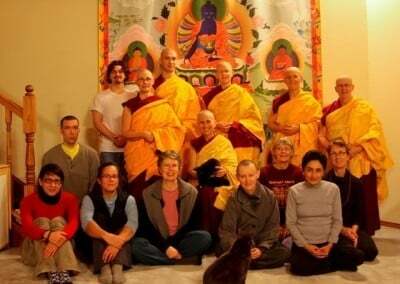 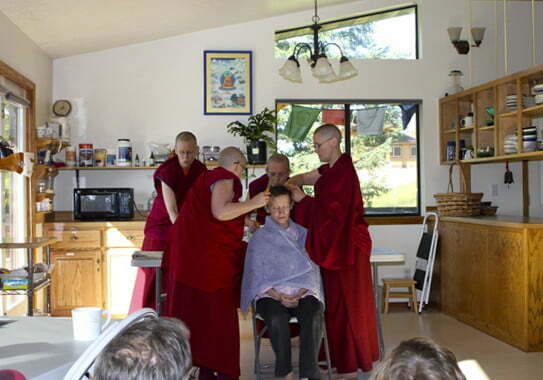 We had many out of town guests including four Bhikshunis of the Chinese Chan tradition. 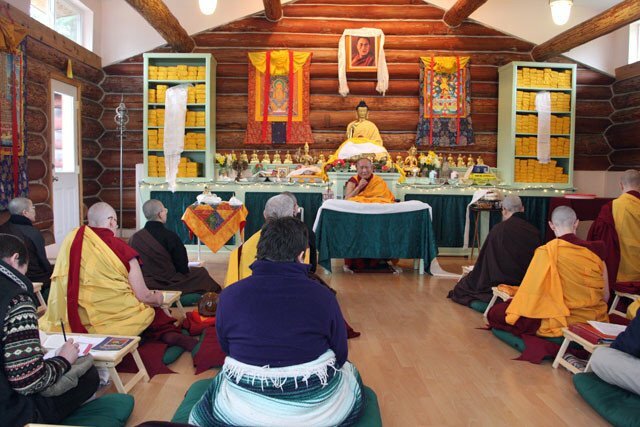 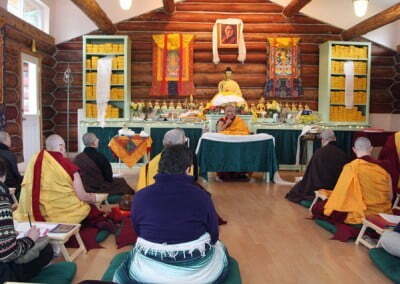 For the 4th time since the founding of Sravasti Abbey, Khensur Wangdak Rinpoche visits and gives teachings. 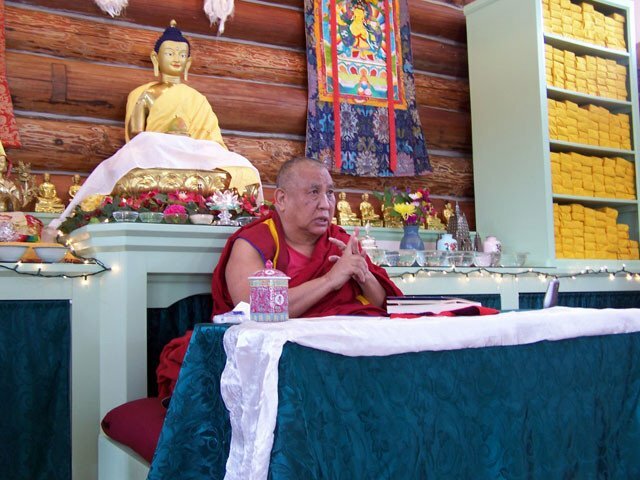 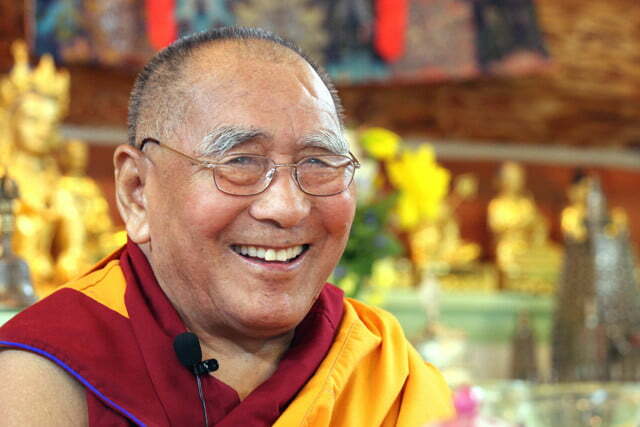 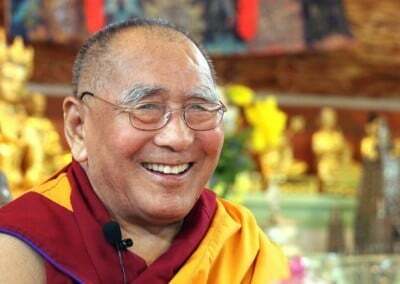 Rinpoche continues with sublime teachings on Chapter 2 of Santideva’s Guide to a Bodhisattva’s Way of Life. 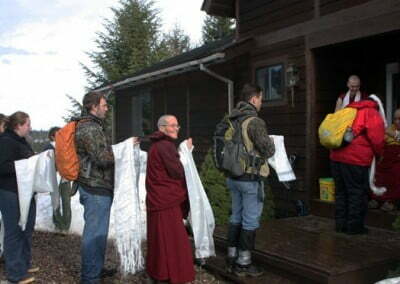 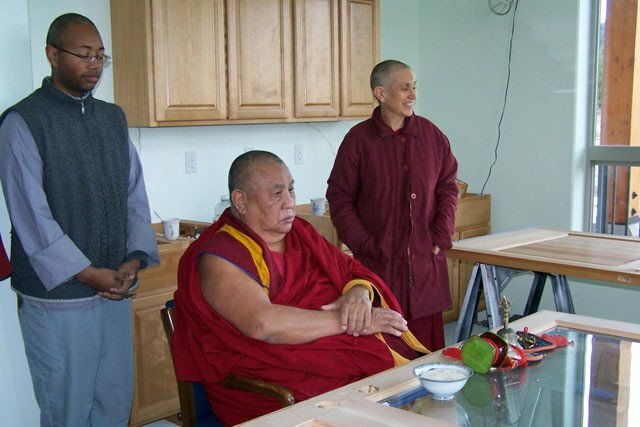 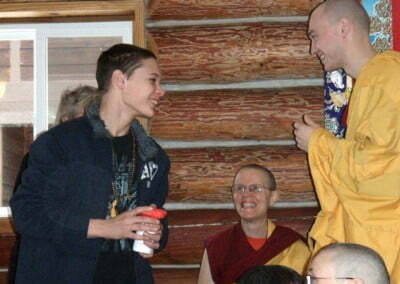 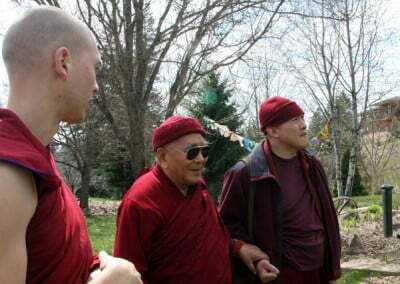 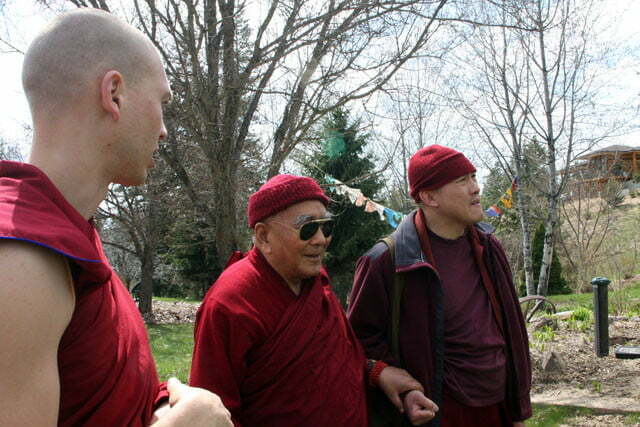 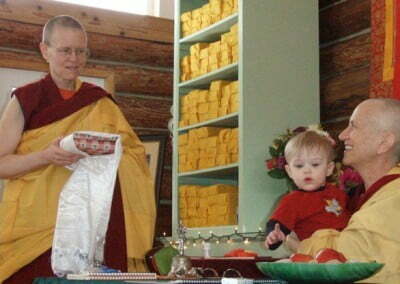 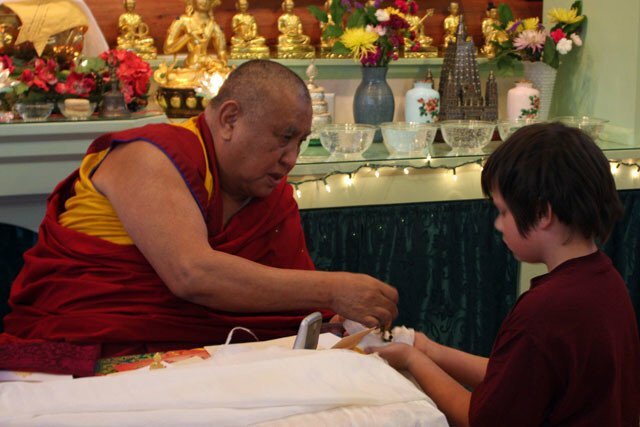 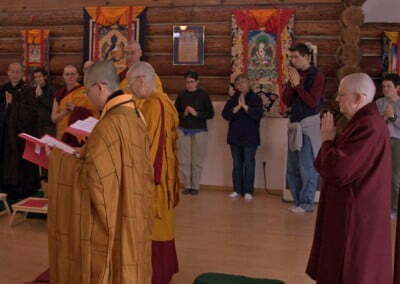 It has also become a tradition that when Rinpoche visits he blesses the Abbey in some way. 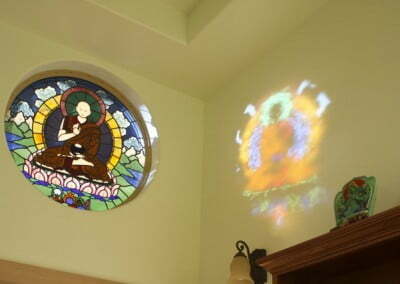 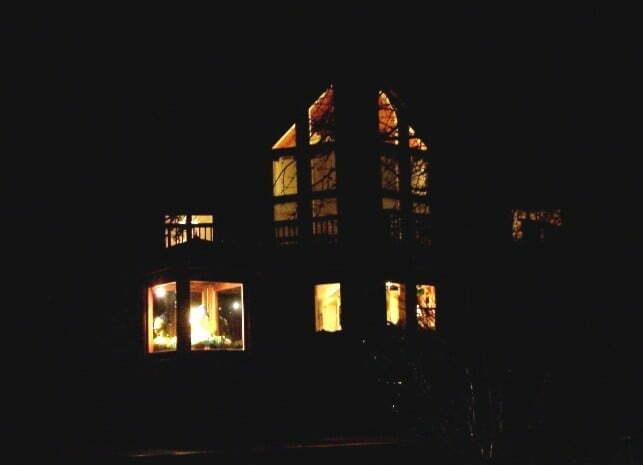 This time he blesses Gotami House in the beautiful library full of light. 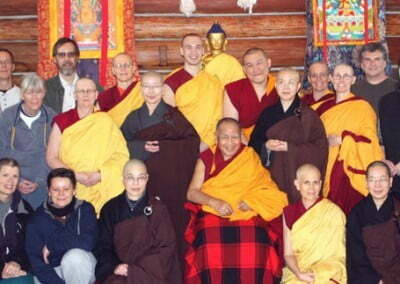 We pray always for Khensur Wangdak’s long life – he is very special to us. 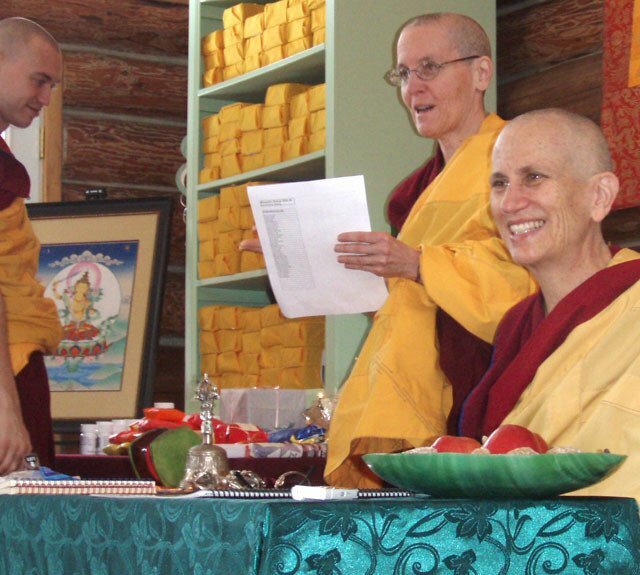 The Abbey celebrates its 5th ordination as Dianne Pratt takes the Sramanerika/ Siksamana novice vows. 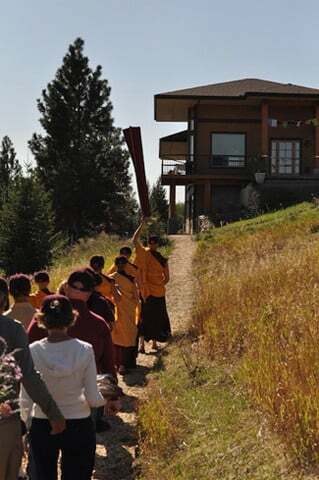 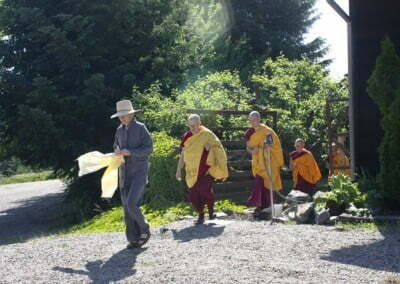 Our stalwart friends, the four Chinese bhikshunis, along with Venerable Chodron, guide Dianne through the beautiful, private ceremony. 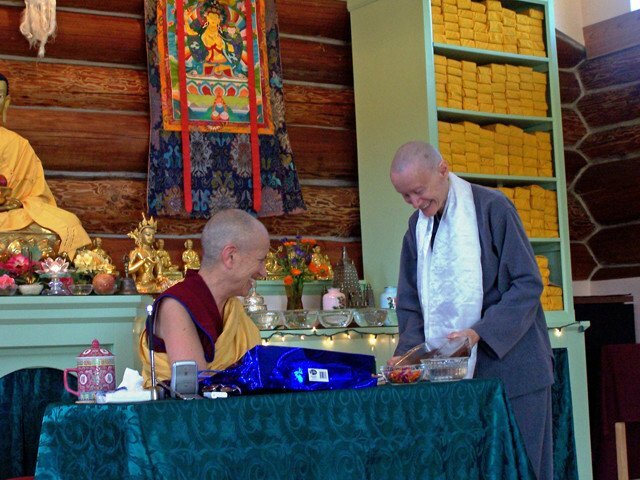 Afterwards the newly ordained Venerable Thubten Jigme (meaning fearless) makes offerings to the bhikshunis, and the Abbey community and guests offer lunch to the Sangha. 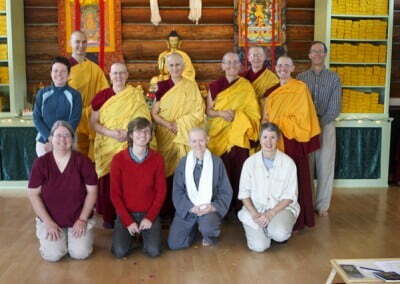 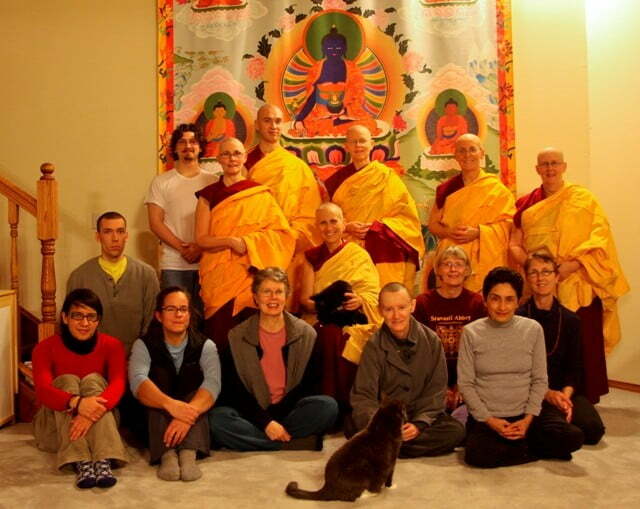 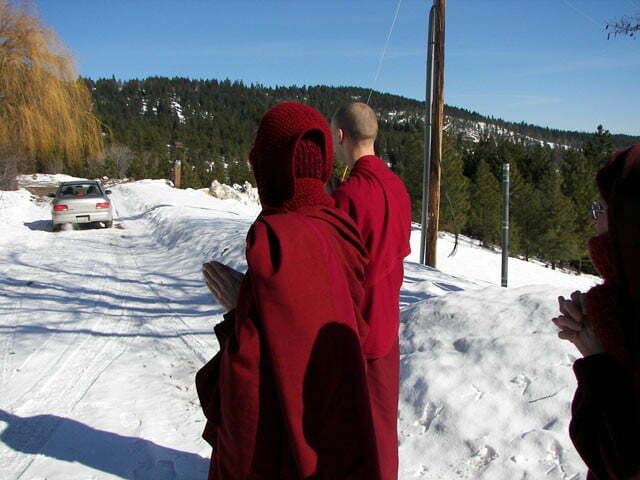 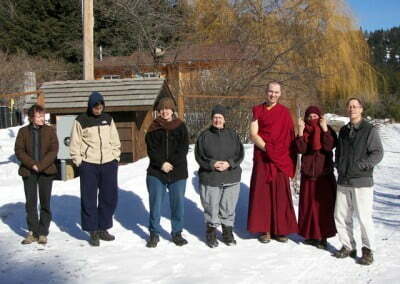 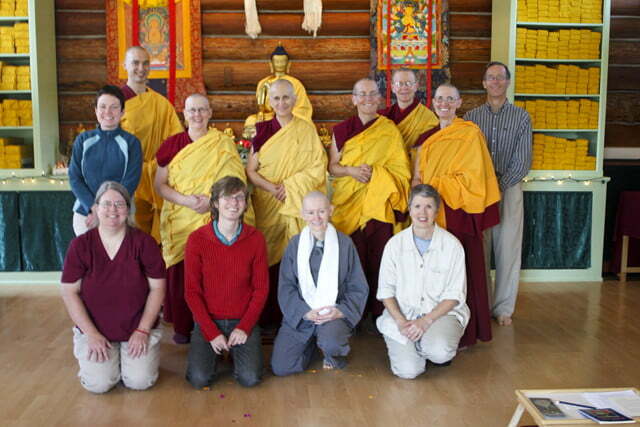 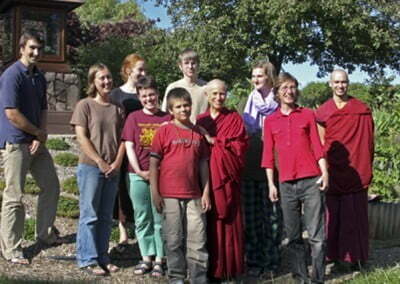 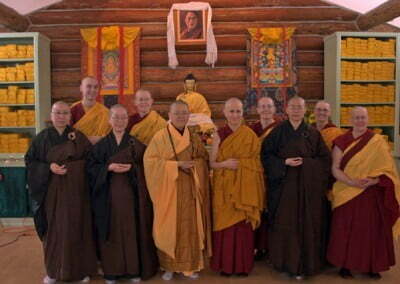 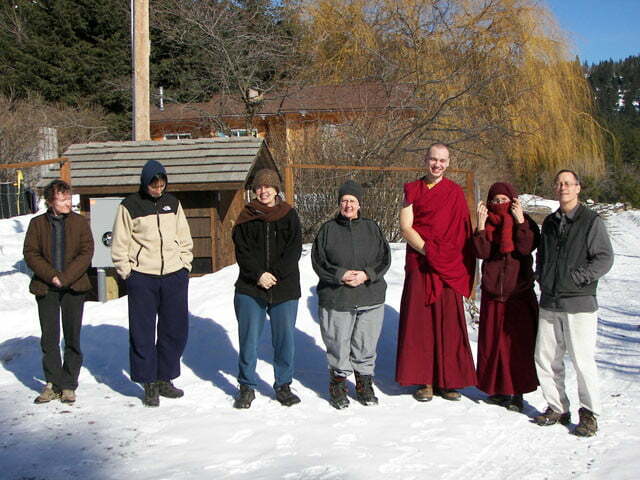 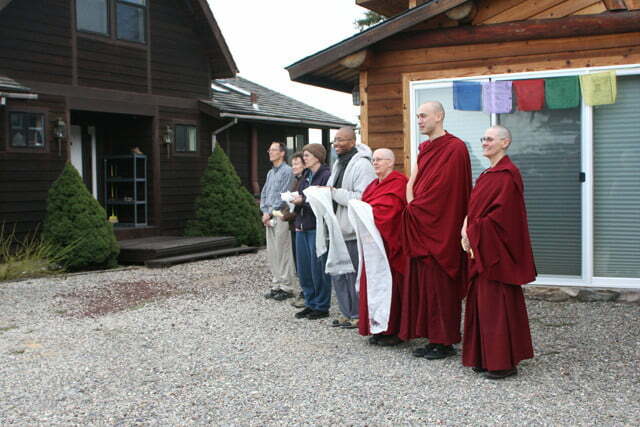 It is a beautiful auspicious day as the Abbey Sangha community grows to six. 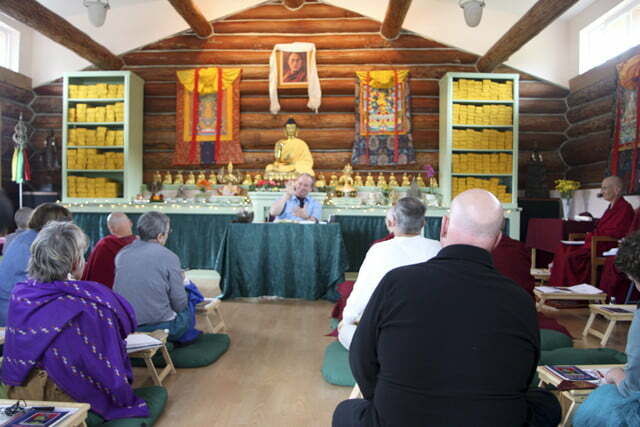 Month three of our Manjushri Retreat allowed for more purification, clarification, practice as well as preparation for upcoming events.